That man is none other than James White, and it’s time to make sure people know just how damn important this dude is – and has been – to the team’s success in recent years. Look, this team runs through Tom Brady, and I don’t think we need to rehash the reasons why he gets all the attention. Julian Edelman, the NFL’s second-leading postseason receiver of all-time, is another player who’s obviously going to get a lot of love. And Gronk, even after a disappointing year by his standards, was the other Pats player who received pretty much all of the coverage at Super Bowl Opening Night – which obviously isn’t surprising considering the dog-and-pony-show nature of the event. 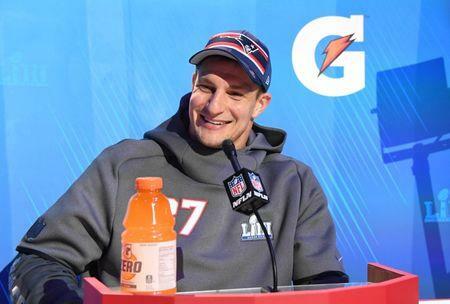 Of course, Gronk made sure to ham it up all night on Monday. But even still, other guys like the McCourty twins and former Patriot/current Ram Aqib Talib (who truly is a gem to listen to) stole the show, with barely a whisper from the Patriots’ leading pass-catcher this season. Yes, that’s right; White has 87 catches this season on a team-leading 123 targets. OH, and he also leads the team with seven receiving TDs on the year. The only receiving category he didn’t lead the team in was receiving yards – a stat in which he still finished second, only behind Edelman. Let’s also not forget about the fact that White converted on six different third-down opportunities in the AFC Championship against Kansas City, helping to keep some very important drives alive in a game that the team won by less than a touchdown. Everyone wants to talk about Rex Burkhead’s and Sony Michel’s four total touchdowns, but White was a big reason why they were even in a position to punch the ball into the endzone in the first place. There’s also a very misleading narrative out there which makes it seem as though White is solely a “third-down back,” meaning he is only capable of providing receiving ability out of the backfield while being useless as a “traditional” ball-carrier. That’s not only entirely untrue, but it’s also just unfair to a man who averaged 4.5 yards per carry in 2018 and has finished with a YPC over 4.0 in four-of-his-five NFL seasons. Contrary to popular belief, this man can actually handle the rock, too. FURTHERMORE, he was asked to carry the ball a career-high 94 times this season – after averaging just over 30 total totes in his previous three campaigns – and he increased his YPC by 0.5 yards, setting another career-high. On the year, he compiled 1,176 yards of total offense with 12 TDs. At the very least, he’s a top-three candidate for team MVP this season, regardless of position. And while his postseason averages of 5.3 receptions and 43.9 yards per game may not jump off the page, he has been THE GUY the team has turned to in the biggest moments. In 2015, he was targeted 16 times in the AFC Championship loss against Denver. I already mentioned how key he was to the victory over the Chiefs last week, and even in last year’s heartbreaker against the Eagles, White touched the ball 13 times and punched in a score. He fought for that game-winner, too! That wasn’t an easy score! No matter what, though, this man just keeps chugging along without a complaint in the world. Seriously, when is the last time you heard something, good or bad, from James White? In fact, maybe that’s a big part of the reason why he’s never really in the limelight. Part of it could totally be by choice, which I completely respect. BUT, I just had to say something, James. Especially considering how important this game is, there’d be no better way to cement yourself, once and for all, as one of the very most important players to ever don the Patriot colors than with another epic performance this Sunday. And even if it’s not another typical big-game showing out of you, any true Pats fan knows you’re one the main reasons why we’re even here in the first place. Much love, No. 28. Much love. This entry was posted in NFL, Patriots and tagged James White, New England Patriots, NFL, Patriots, Super Bowl, Super Bowl Hype, Super Bowl LIII, Super Bowl Preview. Bookmark the permalink.